Lancaster, PA – Local author, speaker and CEO of North Star Marketing, Kae Groshong Wagner, was recently chosen by the 14th Annual International Writer’s Digest Self-Published Book Awards as an Honorable Mention Winner in the Nonfiction Category. Wagner’s book received an excellent rating on all three criteria of structure and organization, grammar and cover design. The judge commented that, “I love the fact the book matches the title; it is a little black book. Wagner breaks branding down in its basic issues and does a good job of explaining just what branding is, why it is important, and how to do it. Writer's Digest is the world's leading magazine for writers, founded in 1920 and the sponsor for the annual International Writer’s Digest awards competition. 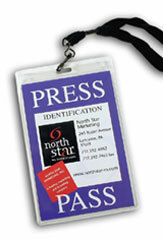 North Star Marketing is a Lancaster, PA-based branding, marketing and advertising firm started by Wagner in 1989. The firm specializes in building brands for a variety of clients in food, manufacturing, retail and professional service businesses. Wagner can be reached at 717-392-6982 X105 or by e-mail at kgwagner@northstar-m.com.